tyre pressure, temperature and more, while ensuring overall personal safety and a longer vehicle life. The connected pod helps you track the last location of your and your loved ones car, no matter where you are! 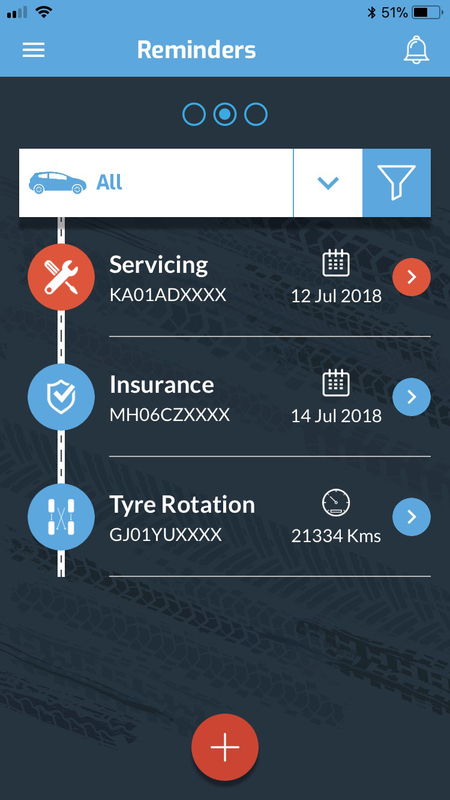 GSM connectivity also adds an extra layer of safety by sending you real time tyre-related alerts on the CARE360 App. 24/7 Remote monitoring of your vehicle no matter where you are. Get all crucial data at a glance. Enjoy complete control over vehicle health and performance through our intuitive, easy-to-understand CARE360 mobile app – available for all smart phones above iOS 9.1 and Android 5.0. 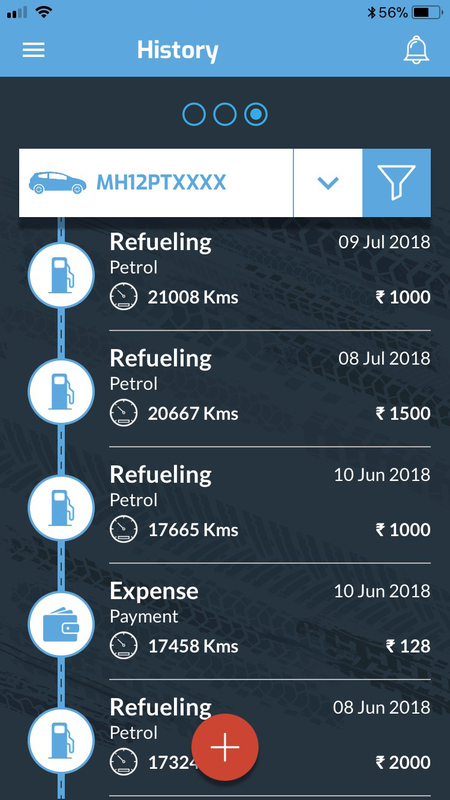 All-round care – Keep a track of fuel expenses, insurance renewals, servicing sessions, tyre rotations and more! 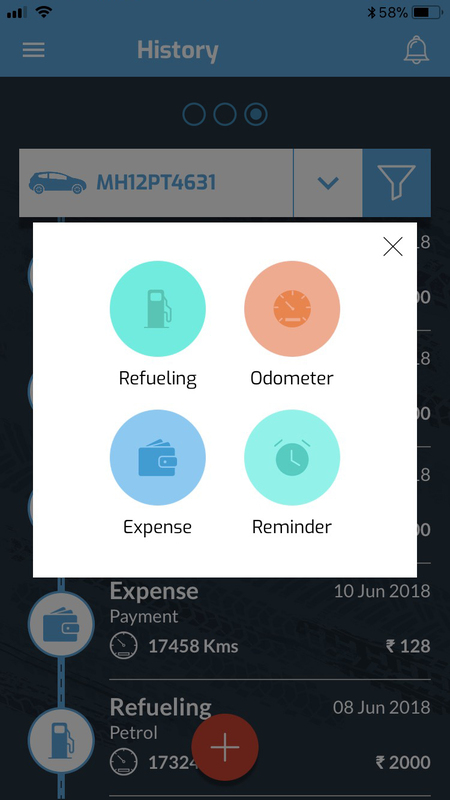 CARE360 tracks and sends timely reminders on fuel consumption, mileage covered, vehicle expenses, tyre rotation schedules, insurance renewals, servicing sessions due; while safely storing all data on vehicle activity and performance. Travelling to a new destination and wondering if your stepney needs to be changed? Or have you been advised to rotate tyres? Either way, TREEL Personal will be your guide with helpful tips and directions. Maintaining optimal tyre pressure leads to less fuel consumed and more money saved. CARE360 also helps you get the best out of your vehicle with timely maintenance tips. Bonus point? If your vehicle is in top shape, you’re also keeping pollution in check. Wondering where the valet takes your car? 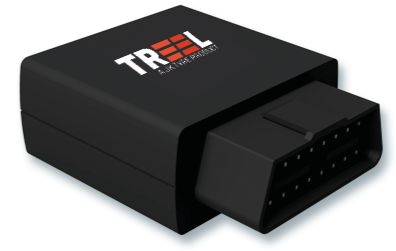 Put your mind to rest with TREEL- the app lets you remotely monitor your vehicle and know its location and other relevant details at all times. Get regular updates on tyre pressure, inflation and air leaks – TREEL Personal detects even the smallest leak, helping you fix it before it leads to a flat tyre. 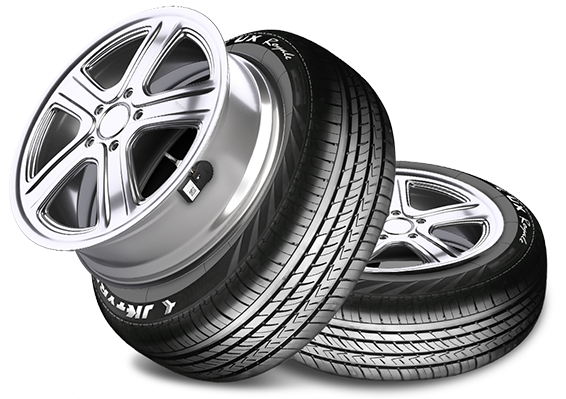 Overheated tyres can burst leading to serious consequences. TREEL helps you avoid tyre bursting accidents by sending real-time alerts on tyre temperature. Don’t get what you pay for. Get more. 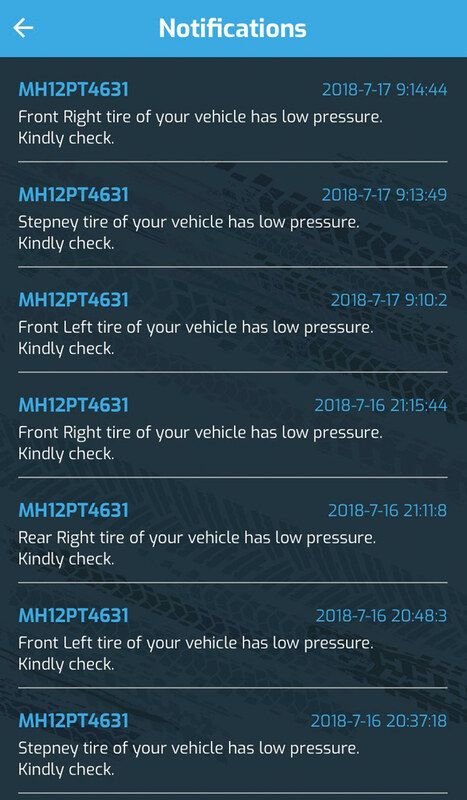 Why install any TPMS (Tyre Pressure Monitoring system) at all ?Vehicle tyres have a lot more importance than one would think – tyres with low pressure drink up more fuel; and can also cause accidents. Plus, overheated tyres can lead to accidents caused by tyre bursts. By installing a device that constantly monitors your tyre temperature and pressure, you ensure maximum safety and savings for you and your family. Why TREEL ?TREEL TPMS is not just a TPMS – it’s a comprehensive Tyre Protection & Maintenance System. Our TPMS not only measures your tyre pressure and temperature, it also alerts you to the smallest pressure leak, while helping you maintain your tyre and vehicle, ensuring maximum performance, safety and savings. What’s included in The TREEL car/bike Personal kit ?Every car kit includes 5 sensors and bike kit comes with 2 sensors. It also has an instruction manual to download the CARE360 app and install the tyres easily. The Connected Car Kit comes with a POD that delivers crucial data anytime, no matter where you are. Also share and keep track on family members for their safety. Do you have a 4 sensor car kit ? We have made your safety our numero uno priority. 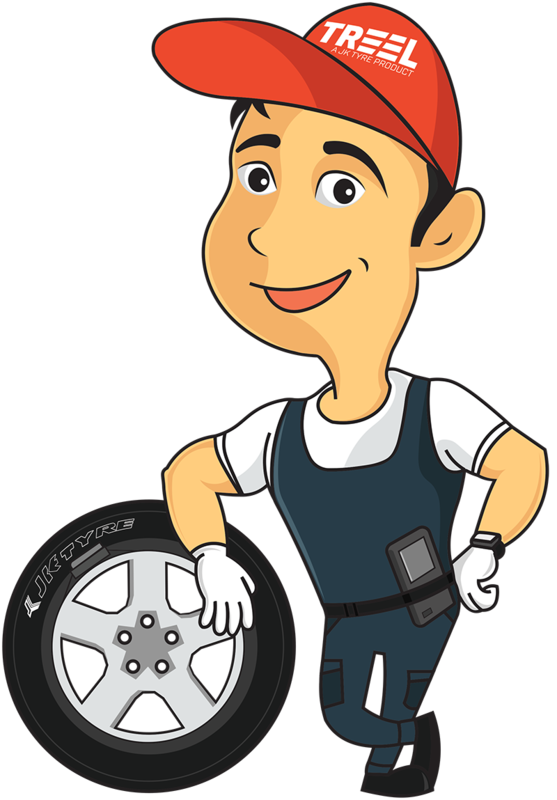 Spare tyres are the most neglected yet the most important wheel for your support when you most require it! Are the sensors external or internal ?The sensors are internal and are mounted and fastened around the wheel barrel / tyre rim with the help of a high grade steel mounted belt – Thus minimizing risk of theft and damage, while not requiring you to fix the wheel balance after installation. Can I install the sensors myself ?Since the sensors are attached to the internal wheel, they will have to be installed by a professional. Is TREEL available for bikes and cars?Yes, it’s available for bikes, cars, batmobiles, batpods, etc. Is TREEL Personal different from TREEL Enterprise ?Yes! TREEL Personal is specially designed for individuals who own vehicles for personal use. On the other hand, TREEL Enterprise consists of an enterprise-level software that monitors a fleet of vehicles, including heavy vehicles like trucks and freights. How do the TREEL sensors work ?The TREEL sensors connect to the app via Bluetooth. You then get tyre pressure and temperature updates and alerts on your CARE360 app. 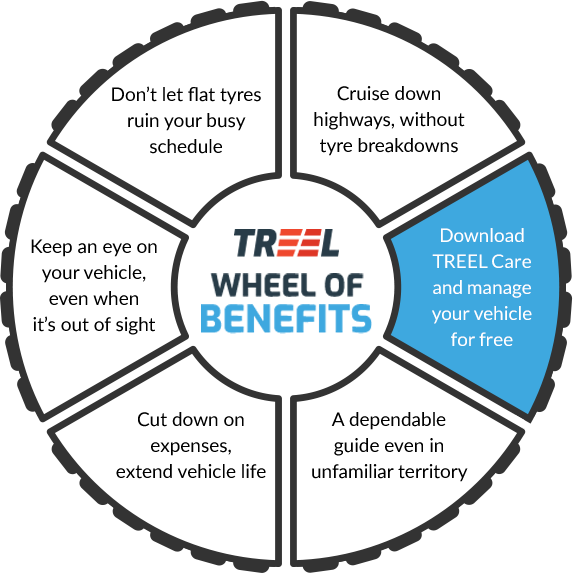 Will TREEL work without the app ?Only the connected / wireless car kit will use email notifications to send you alerts on tyre pressure, leak detection and more. The bluetooth car kit does not allow for this – maybe someday we’ll find a way to make that happen. But until then, you need to download the app first so that the sensors can send you alerts. How close do I have to be to the vehicle in order to get alerts/updates ?The app will connect to the sensors via Bluetooth when it’s within 100 ft of them. If the app is more than 100 ft away, it won’t read the information from the sensors. How much phone storage/battery will it consume ?TREEL CARE360 consumes less than 10 MB space on your phone – that’s much smaller than a Whatsapp video. It’s a very light, yet a very hard-working app. How long will the device battery last ?The battery for our internal TPMS sensors are designed to last for 5 years! What’s the warranty period on the sensors ? All our sensors with a warranty of 5 years. 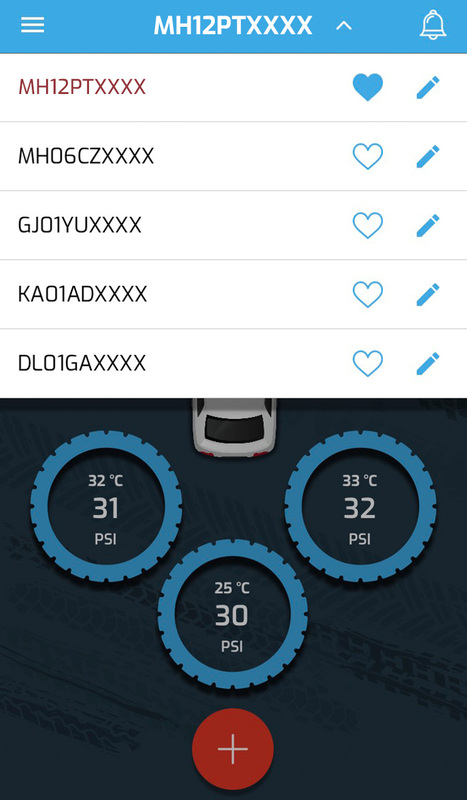 Can I customize the pressure setting on the app ?Yes you can customize the pressure points for the alerts and also customise the recommended pressure setting as per the recommendation of the car/ bike manufacturer. How many tyres can be added on the CARE360?This depends on your vehicle type – We give 5 sensors for Cars (4 driving tyres + 1 Stepney) & for bikes we provide 2 sensors. The app gives you the ability to monitor up to 10 vehicles in one-go. What version of Android /iOS does the CARE360 app support ?You can use the CARE360 app on Andorid 5.0 and above and iOS 9.0 and above. Oops – I lost my phone, and the application. Now what ?This does not put a halt on any of your plans! We have secure servers that backup data and your configuration settings. Just re-download the CARE360 app on your new phone and sign in with your account. It’s that simple! Can I resell the sensors to somebody else ?Well you cannot directly resell them. But, you can do so through the transfer vehicle functionality – though we’d be sad to see you go. How quickly will I start enjoying the benefits of TREEL ?Almost immediately – as soon as you download and install the app; and get the sensors installed correctly! Of course, it all depends on what action you take once you get the alerts and updates – if you neglect to fill air in your tyres despite a low pressure alert, you may not be helping your cause much. Is TREEL made in India ?Yes, and proudly so, by 2 relentless innovators and disruptors that are backed with a team of homegrown, turbo-boosted software and hardware experts! Where there is a Wheel, We have a Safer Way!